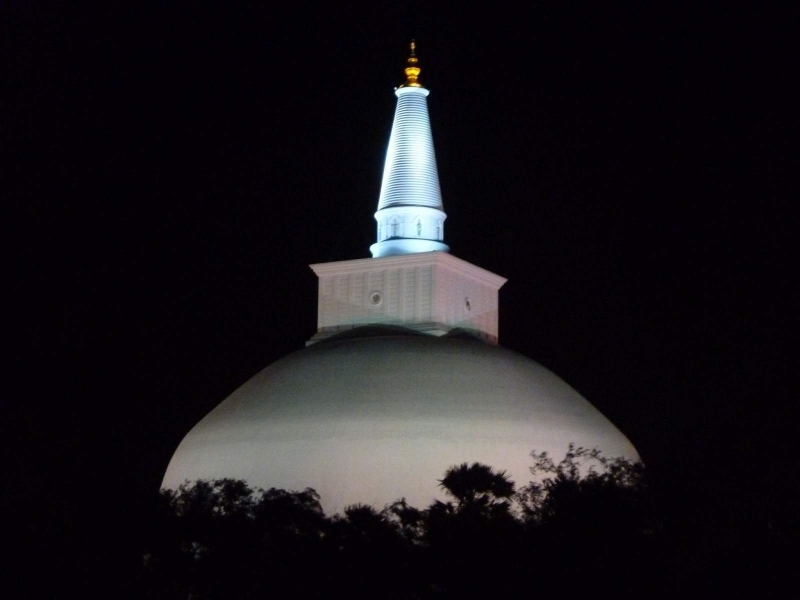 Anuradhapura was first settled by Anuradha, a follower of Prince Vijaya the founder of the Sinhala race. 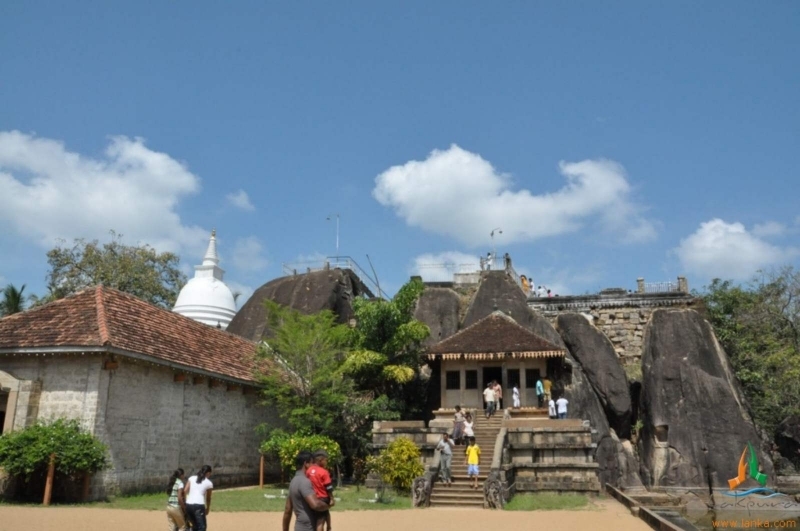 Later, it was made the Capital by King Pandukabhaya at about 380 B.C.According to the Mahavamsa, the epic of Sinhala History, King Pandukabhaya’s city was a model of planning. Precincts were set aside for huntsmen, for scavengers and for heretics as well as for foreigners. There were hostels and hospitals, at least one Jain chapel, and cemeteries for high and low castes. 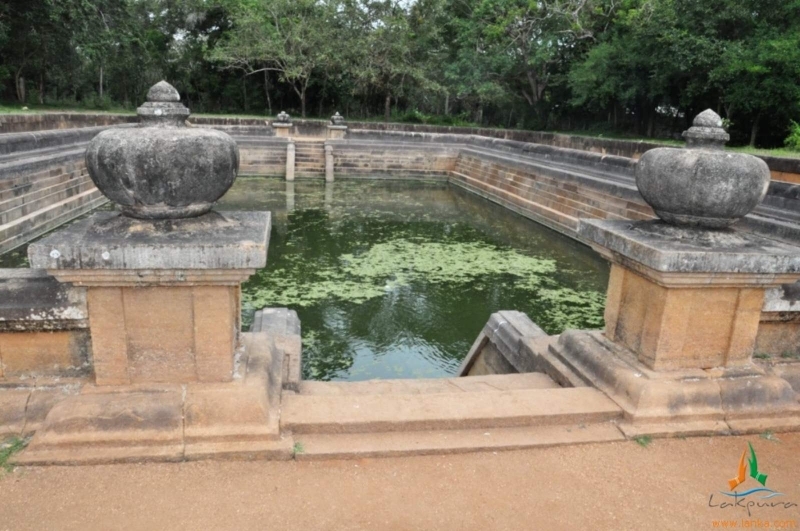 A water supply was assured by the construction of tanks, artificial reservoirs, of which the one named after the king itself exists to this day under the altered name of Baswakkulam. 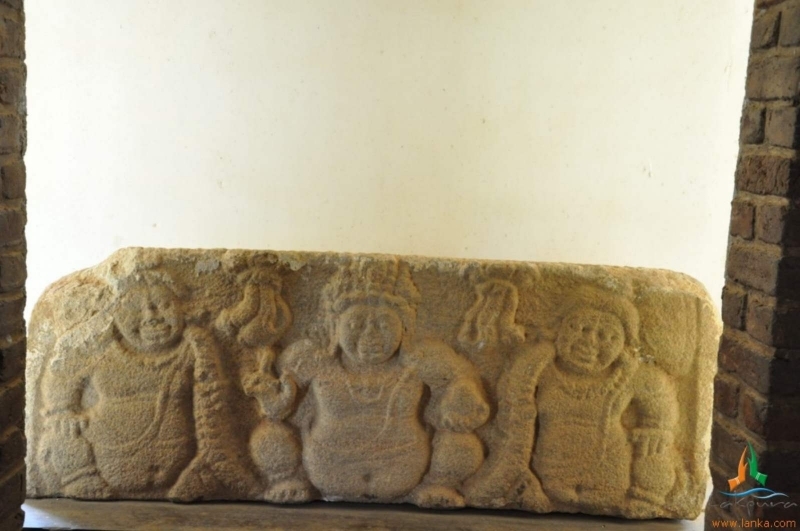 It was during the reign of King Devanampiya Tissa (250 – 210 B.C.) 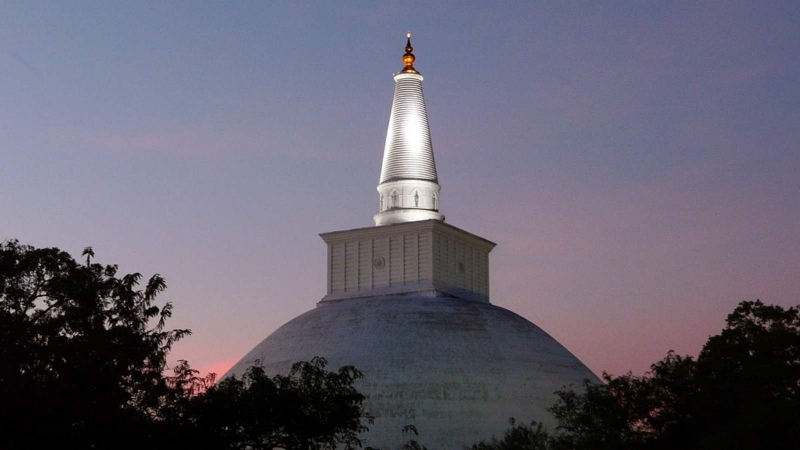 that the Arahat Mahinda, son of the great Buddhist Emperor Asoka, led a group of missionaries from North India to Sri Lanka. 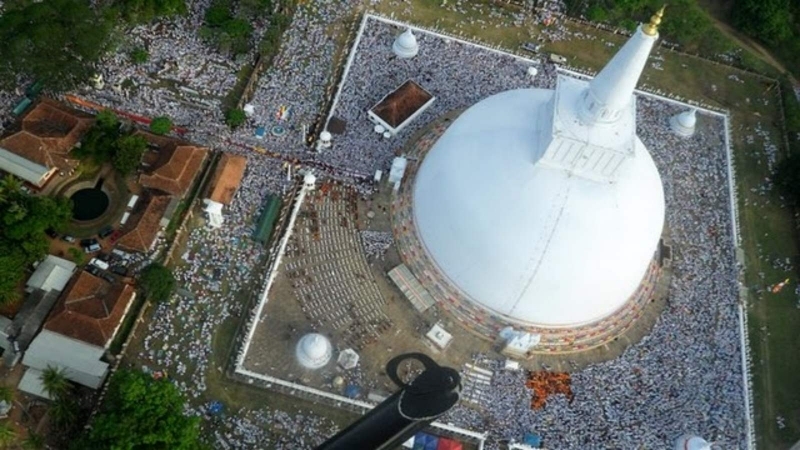 With his followers he settled in a hermitage of caves on the hill of Mihintale – the name which derives from Mahinda’s own.The new religion swept over the land in a wave. 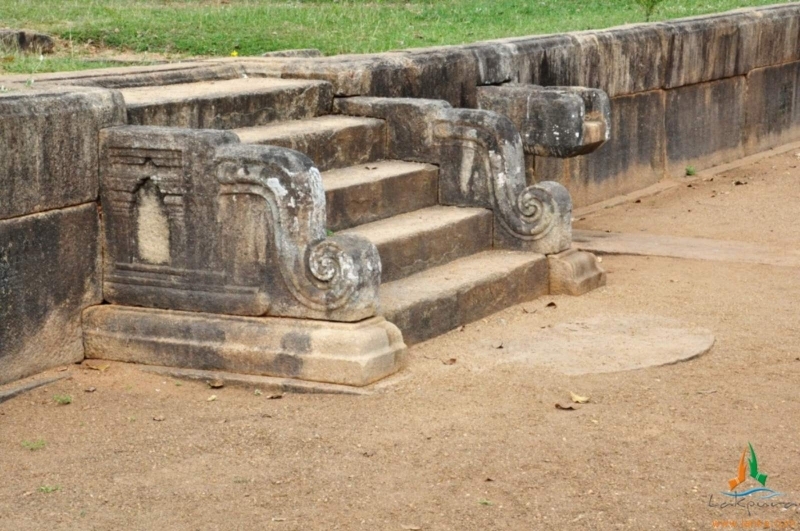 The King himself donated land for a great monastery in the very heart of the city which was also his own Royal Park – the beautiful Mahamegha Gardens.The Buddhist principality had had but a century to flourish when it was temporarily overthrown by an invader from the Chola Kingdom of South India. The religion, however, received no set-back. For his entire martial prowess, King Dushta Gamini must have been a man of singular sensibility. 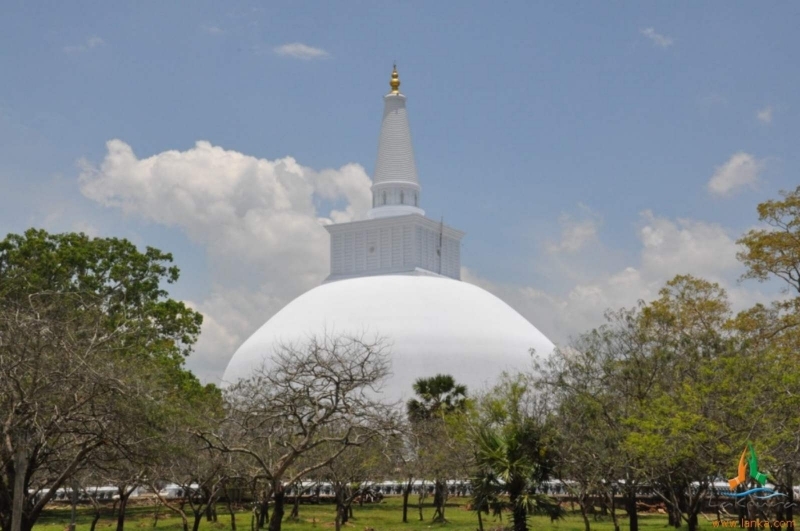 He built the MIRISAVETI DAGOBA and the mighty Brazen Palace, which was nine stories high and presented to the Mahasanga (order of monks). 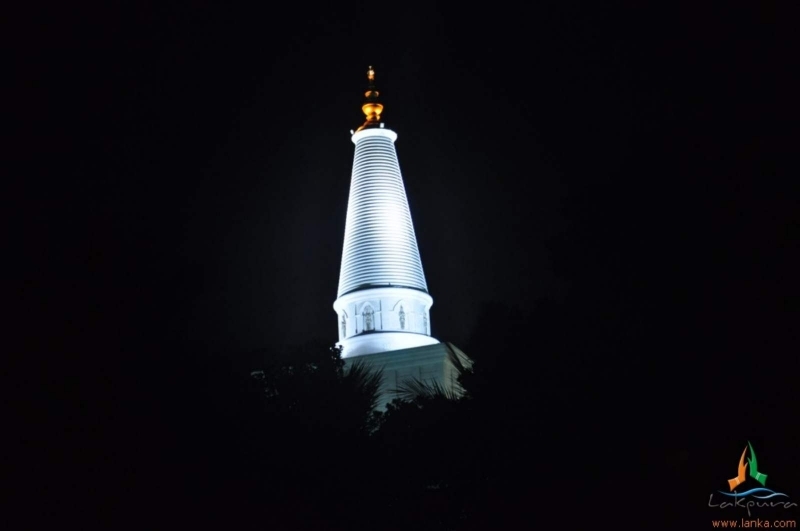 But, the RUWANVELI DAGOBA, his most magnificent creation, he did not live to see its completion. 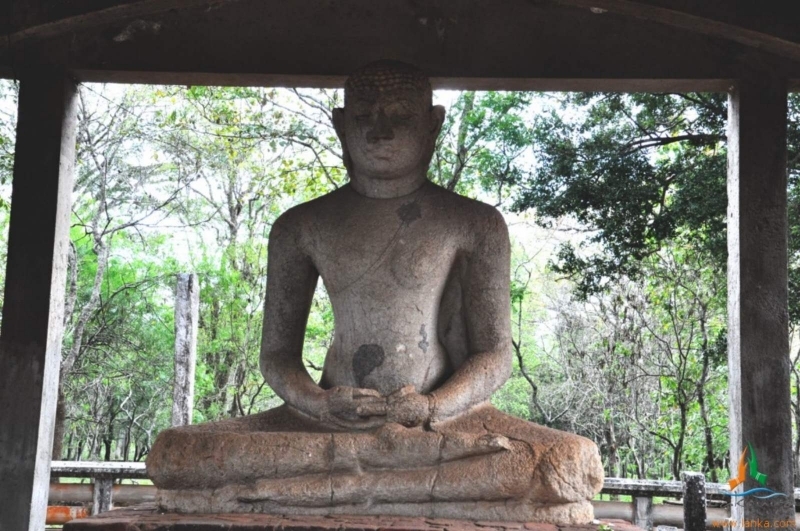 Two more, at least, of the Anuradhapura Kings must be mentioned – if only because some of the greater monuments are indisputably attributable to them. 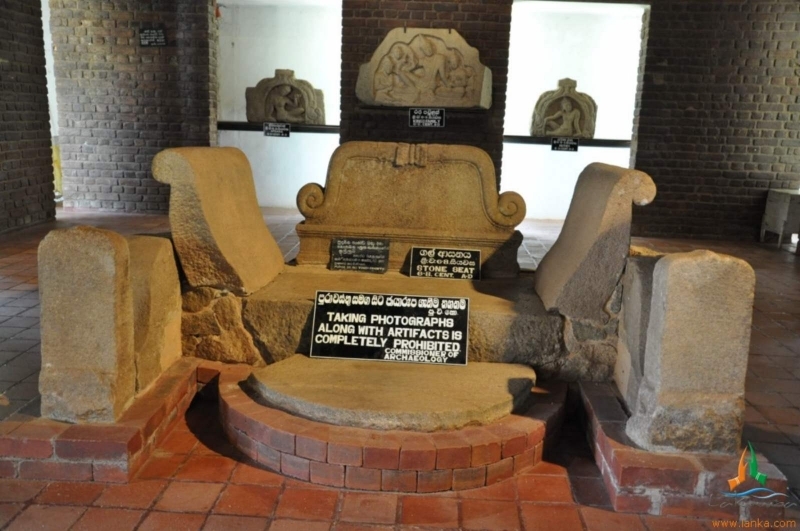 The earlier of these was Vattagamani Abhaya (Valagamba) (103 & 89-77 B.C.) in the first year of whose reign Chola invaders again appeared and drove him temporarily into hiding. For fourteen years, while five Tamil Kings occupied his throne, he wandered often sheltering in jungle caves. It is recorded that as in his plight as he passed an ancient Jain hermitage, an ascetic, Gin called and taunted him. “The great black lion is fleeing!” Throughout his exile the gibe rankled. Winning the Kingdom back at last, he razed Giri’s hermitage to the ground, and built the ABHAYAGIRI Monastery. The name is a wry cant on his own name and the tactless hermit’s as well as (meaning mountain of fearlessness) a disclaimer of his cowardice! 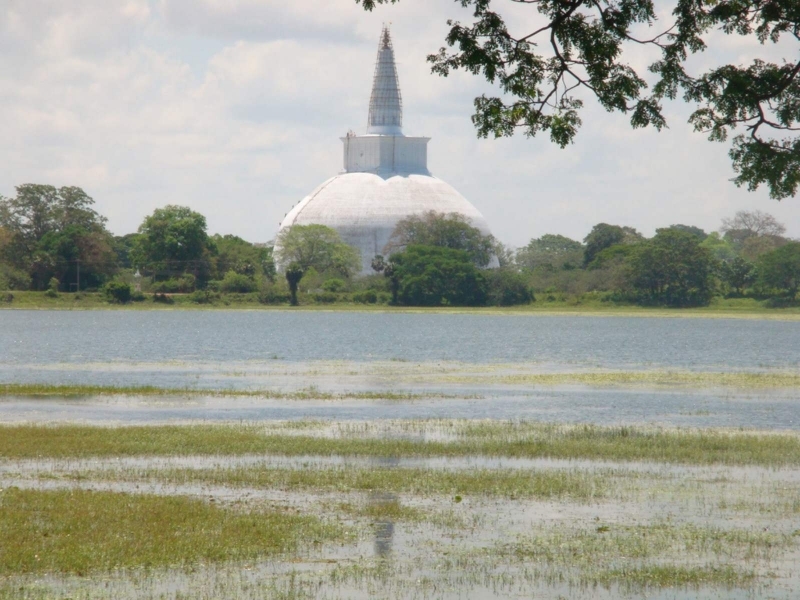 Next came the heretic king Mahasena (274 – 301 A.D) who built Sri Lanka’s largest Dagoba JETAWANARAMA (World Heritage Site), a much complicated irrigation system and 16 vast reservoirs (tank) like MINNERIYA, even today which irrigate thousands of acres of paddy land. 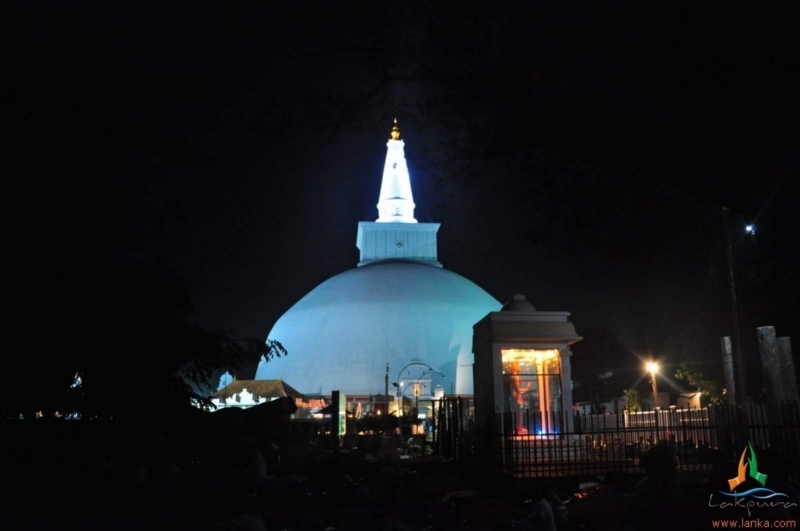 Anuradhapura was to continue for six hundred years longer as the national capital. But as the protecting wilderness round it diminished with prosperity and internecine struggles for the royal succession grew, it became more and more vulnerable to the pressures of South Indian expansion; and the city was finally abandoned and the Capital withdrawn to more secluded fastnesses. But the monuments of its heyday survive, surrounded by such beauties as they become the past: the solemn umbrage of trees, the silence of cold stone, and the serenity of the sheltering sky. 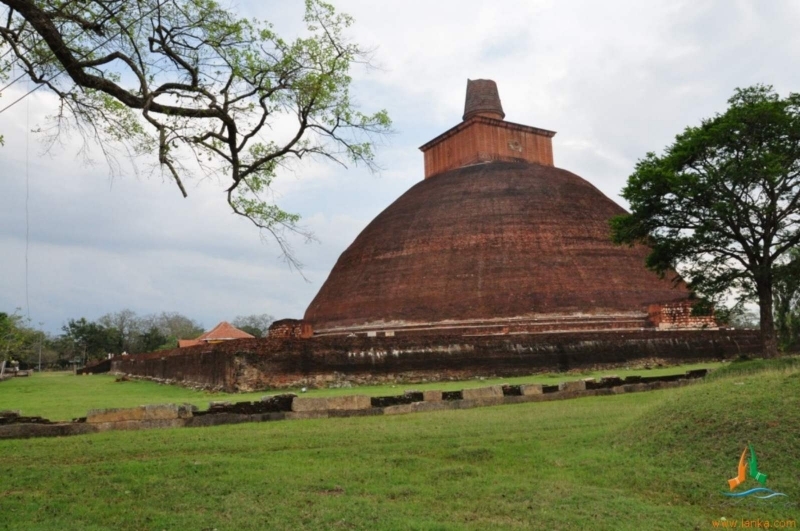 The construction of Ruwanweliseya was prophesied by the great Buddhist missionary Maha Thera Arhath Mahinda, who brought Buddhism to Sri Lanka from India during the reign of King Devanampiya Tissa (250-210 BC). 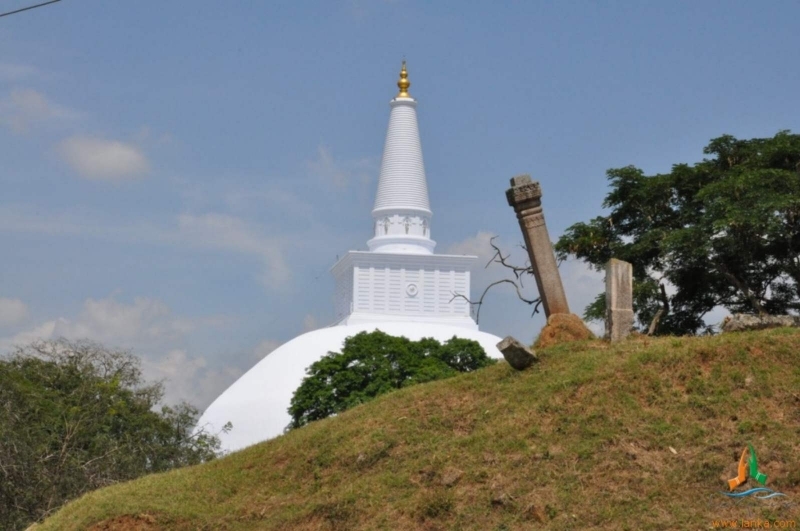 Having heard of the prophesy of Maha Thera Mahinda to the effect that a great Stupa would be built by a great king at a certain location at Anuradhapura, King Devanampiya Tissa had an inscription pillar planted at the said location narrating the prophesy. A little more than a century later, the inscription pillar was destined to be found by a fitting hero: King Dutugamunu (101-77 B.C. 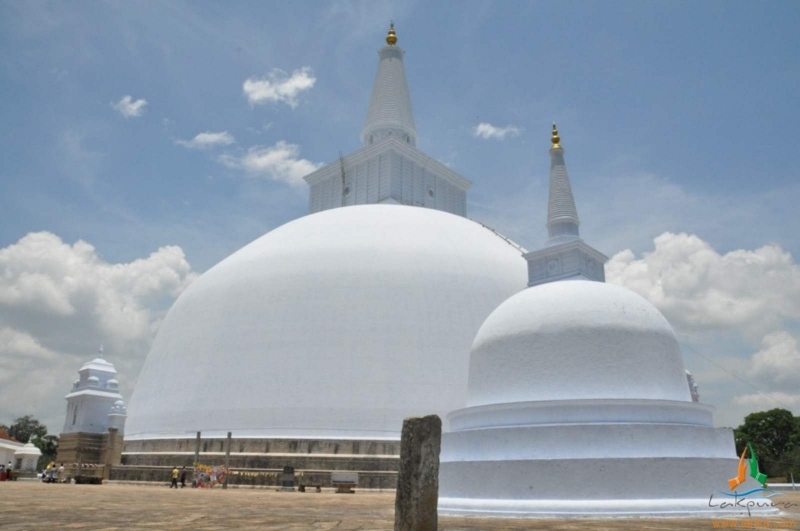 ), who rescued the Sinhalese Buddhist nation from the Dravidian invader. 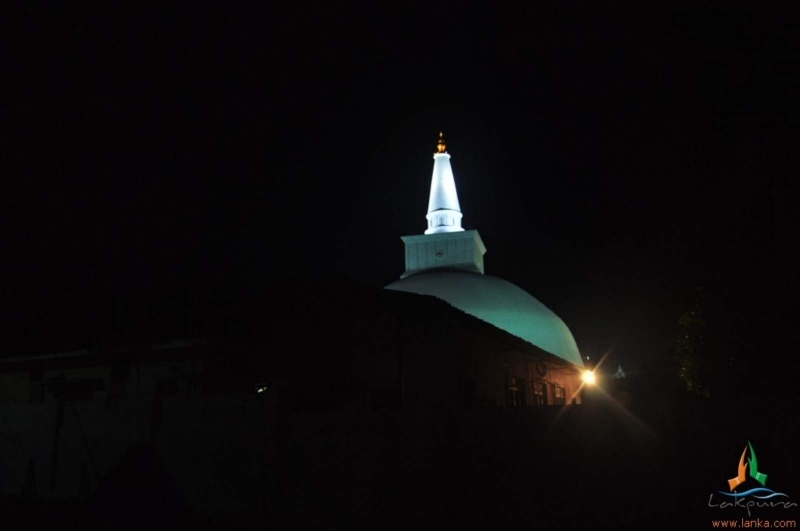 “The Hero of the Nation” wasted no time and commenced the construction of Ruwanweliseya also named Maha Stupa or Ratnapali Stupa or Swarnamali Stupa. 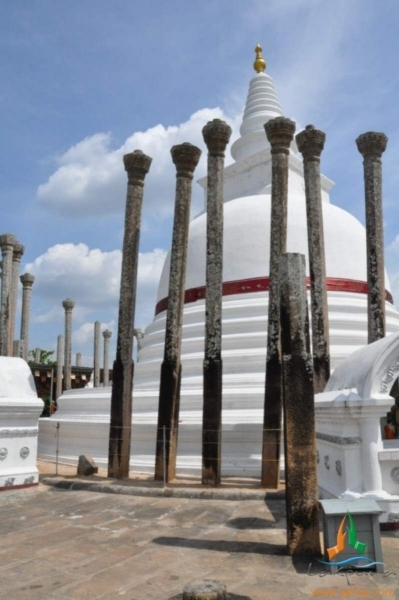 Following the declaration of the king that no work at the great stupa should go unrewarded, a streak of luck dawned on the pious king: a rich vein of Silver was discovered at a village subsequently renamed Ridigama meaning Village of Silver in Sinhala. 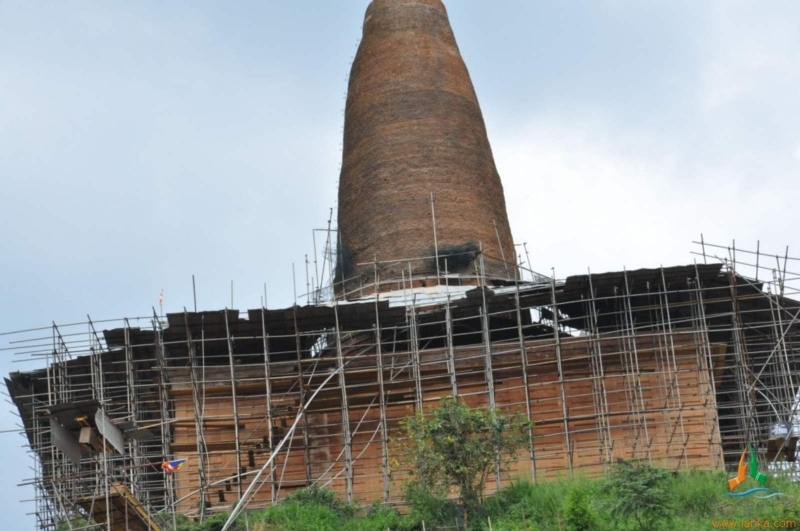 The construction of the stupa cost the king 6.4 million coins in wages alone. 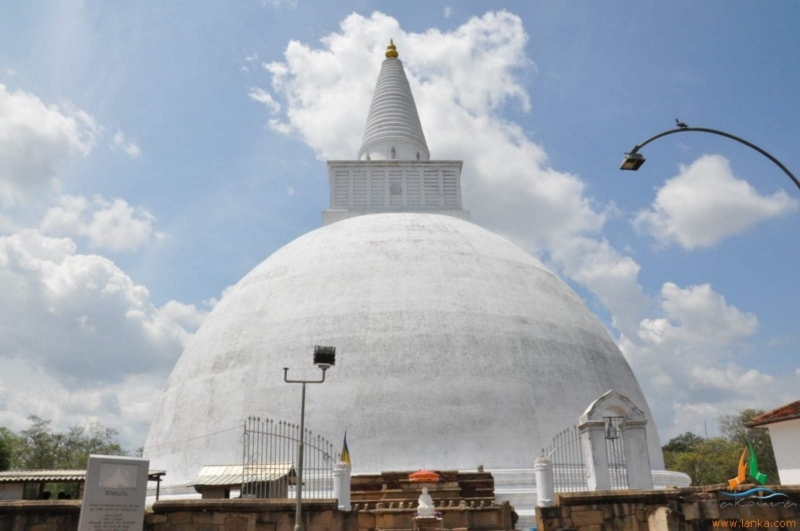 Standing at a circumference of 370 feet and a height of 180 feet, Ruwanweliseya, the third largest stupa of Sri Lanka, is the focal point of the Maha Vihara, the first monastery of Sri Lanka. 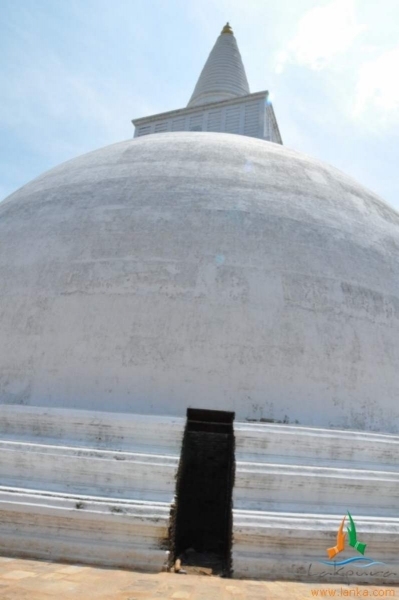 It is believed that a considerable amount of relics of Buddha is enshrined in this glorious stupa, built in replicating the shape of a bubble of water. At the eastern entrance to the stupa is a statue of King Dutugamunu. 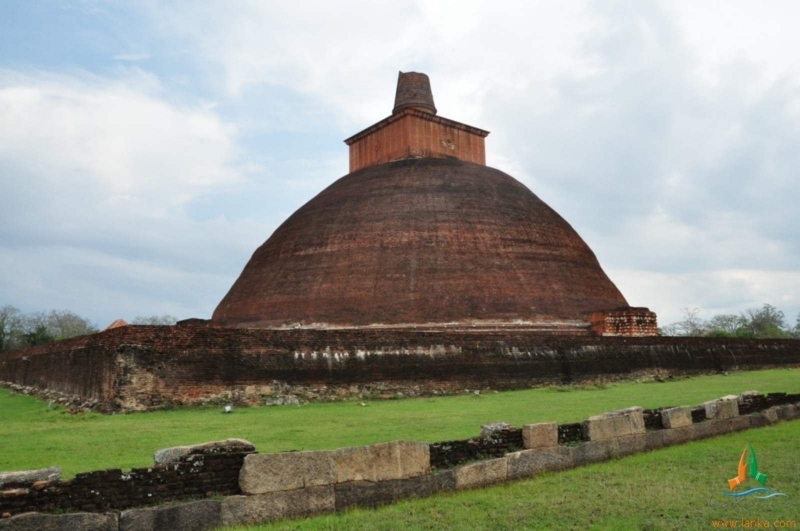 According to the records made by Fa Hsien, the Chinese Buddhist monk, who toured Sri Lanka in the 5th century CE, Maha Vihara monastery housed no less than 3000 Buddhist monks. Since the death of King Dutugamunu, “The Hero of the Nation”, the great stupa had been renovated by a succession of Sinhalese kings till King Nissanka Malla (1187-1196 AC). 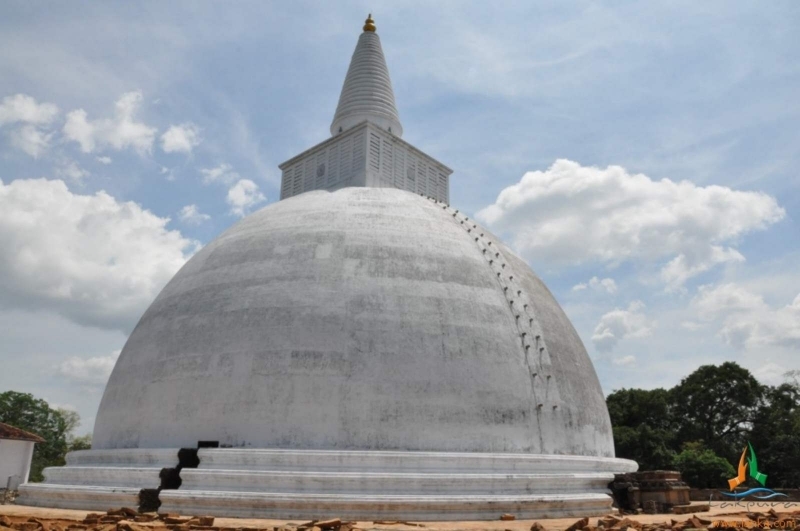 By the 19th century, Anuradhapura, once the greatest monastic city of the world, also named Anurogrammon, by the Greek cartographer Claudius Ptolemy (90-168 AD) was deserted; Ruwanweliseya was in ruins. 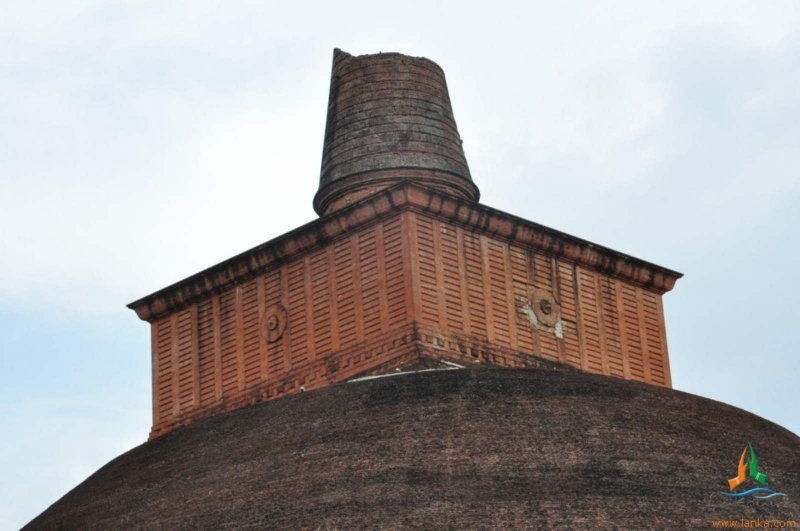 In the year 1893, a patriotic and pious Buddhist monk called Naranvita Sumanasara Thera supported by a community of humble villagers in the region, took upon the Herculean task of reconstructing the great stupa. The community resulted in forming a society called Ratnamali Chaityawardhana Society. Today, all we have are 1600 stone pillars in 40 rows of the Brazen Palace. A great gleaming roof, made of copper, slanting down to all four sides from the centremost point gave shelter to 1000 windowed chambers in 9 stories rising to a height of 150 feet. That was during the reign of King Dutugamunu, ‘The Hero of the Nation”. 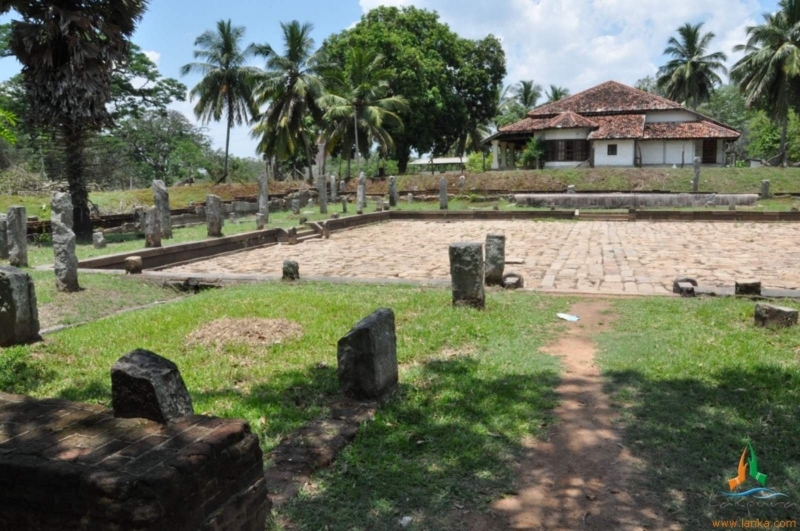 Such was the splendour of the monumental Brazen Palace built on the location of the chapter house called Mahamucala Malala consecrated by Maha Thera Mahinda, the apostle of Gauthama Buddha who devoted his lifetime to propagating Buddhism in ancient Lanka. 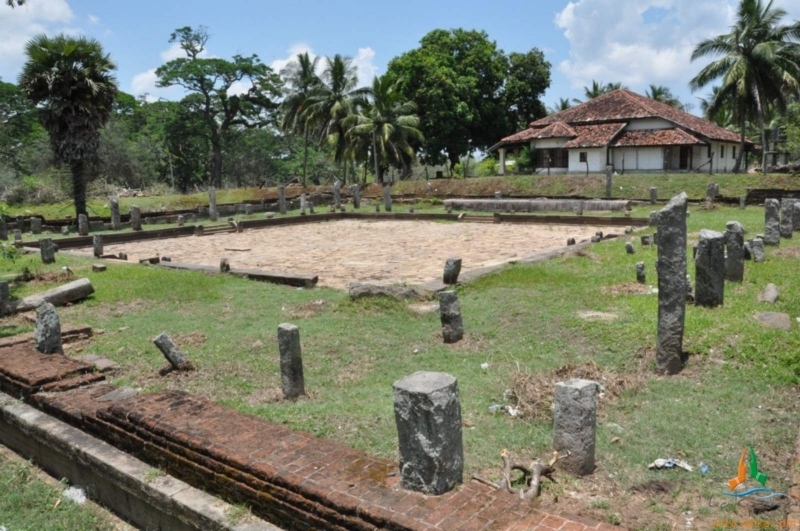 Adjoining Lohapasada or Brazen Palace are ruins of an Alms-hall called Catussala of the Buddhist monks of Mahavihara monastery. At the eastern corner of these ruins is a rice boat, a 45 feet long vessel cut into a slab of rock that could contain alms to at least 3000 monks at a time. The rice boat corresponds well with the narration of the Chinese Buddhist scholar Fa-Hsien. 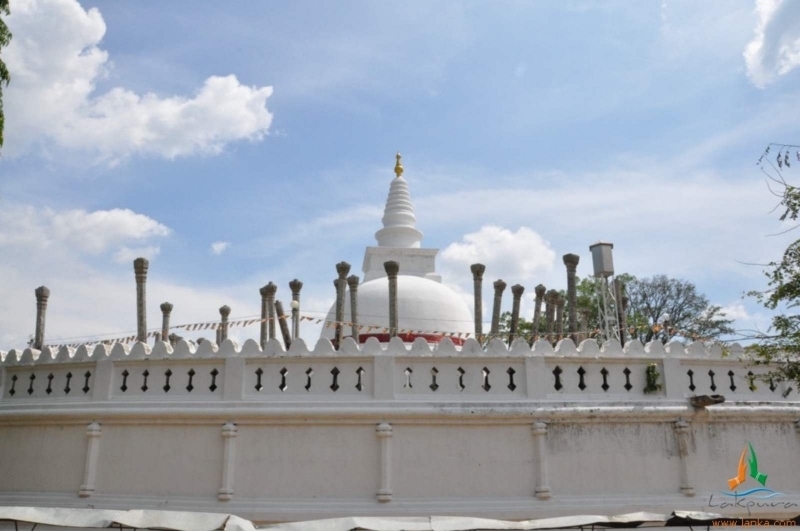 According to him, there were 3000 monks at the Maha vihara monastery at Anuradhapura. 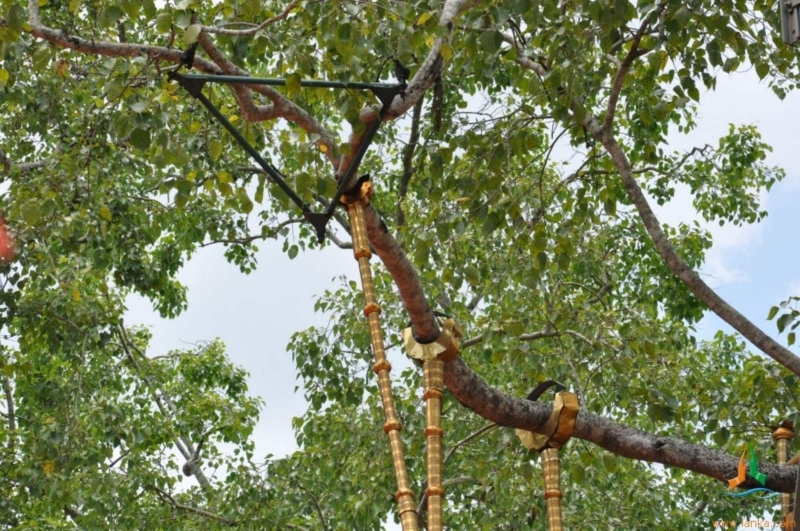 It is hard to believe – but there is no shadow of doubt at all – that this small tree with limbs so slender that they must be supported on iron crutches, is the oldest historically authenticated tree in the world (2,250 years). It has never since been without its hereditary attendants and care, to the very end, of the country’s kings. 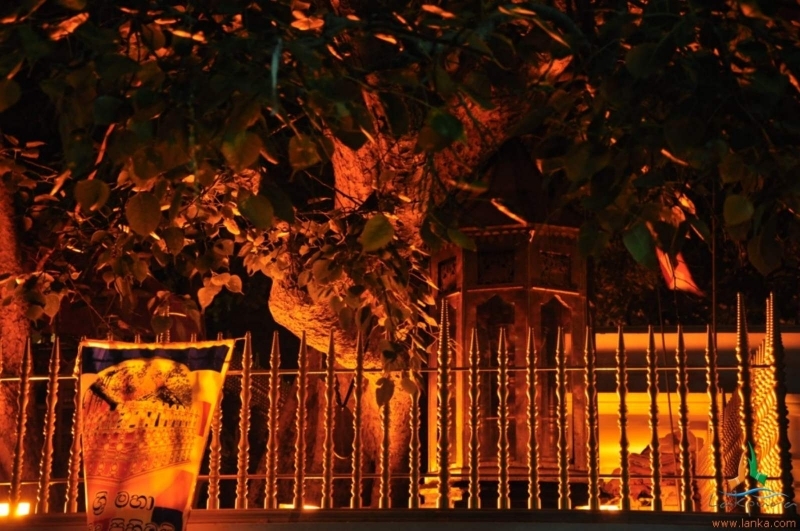 As lately as the reign of King Keerti Sri Rajasingha, a wall was built around the tree. In 1966 it was enclosed with a golden railing. 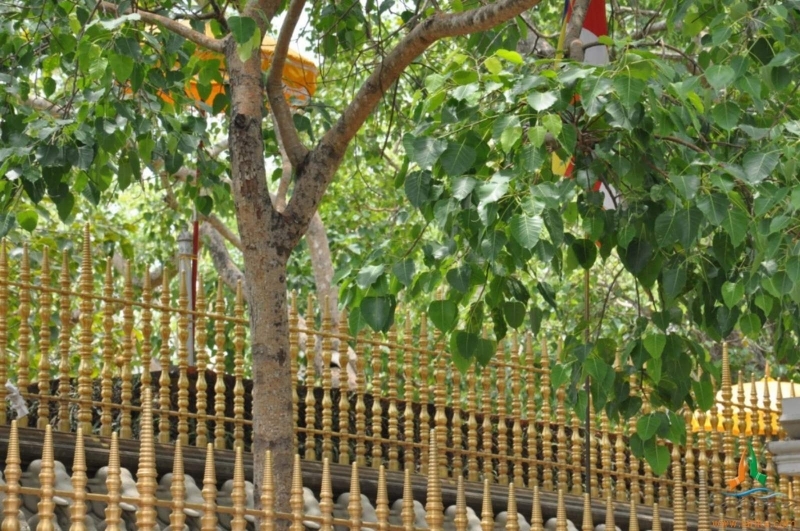 The great ancient Sinhalese Buddhist monuments of Anuradhapura are clustered around this Peepal tree (ficus religiosa) called Sri Maha Bodhi, a sapling of the Peepal Tree at Buddha Gaya, Northern India in whose shelter Gautama Buddha attained supreme enlightenment. 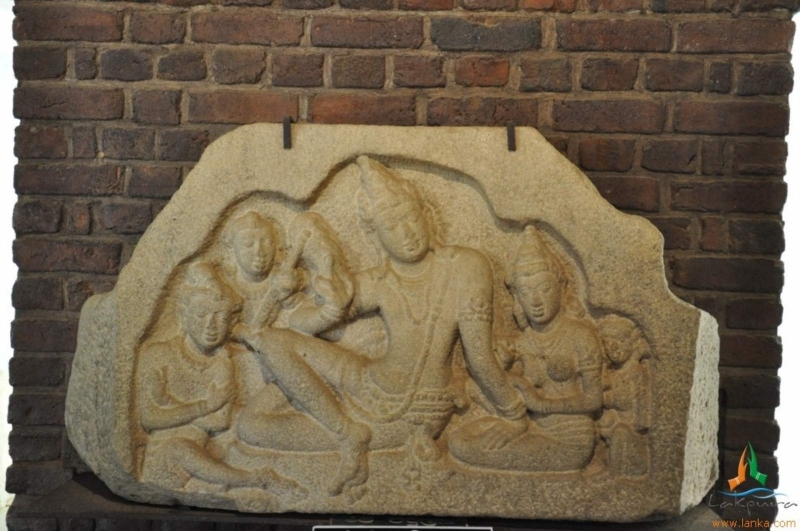 The sapling was brought to Sri Lanka by Buddhist nun Sanghamitta, the daughter of King Asoka of India during the 3rd Century B.C. 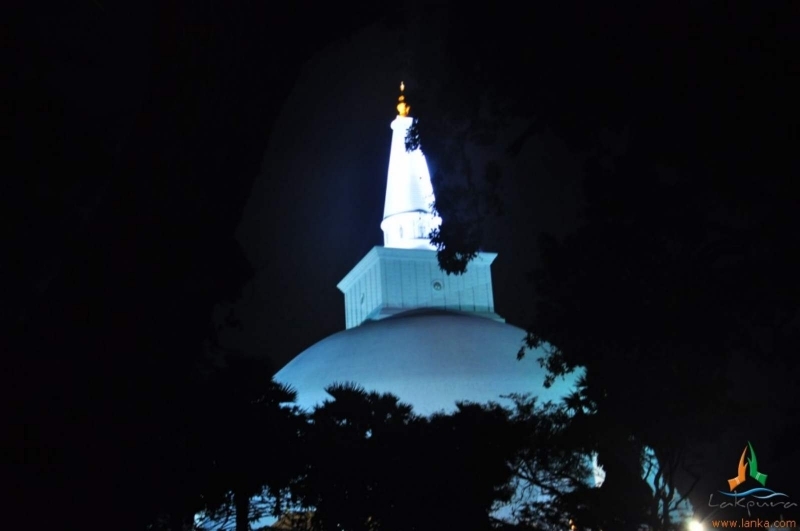 To the north of the well protected and well adorned tree are three great monasteries: the Mahavihara, the Abhayagiri and the Jetavana. 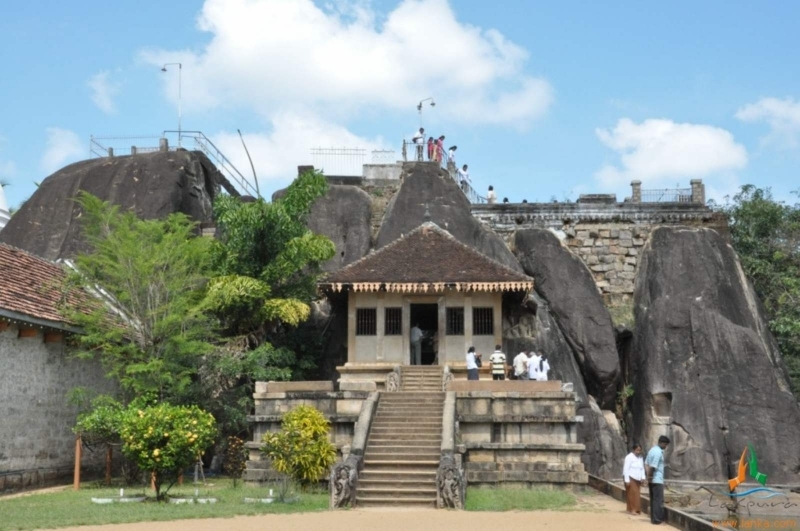 Abhayagiri Monastery spreading over an area of 200 hectares, was founded by King Valagamba also known by Vattagamini Abhaya (109 BC-89-77 BC) following his ascent to the throne for the second time, having the Dravidian invaders put to sword and fire. The monastery was built following the destruction of the Jain hermitage, whose ascetic Giri had taunted King Valagamaba while he was fleeing from invaders from Southern India 14 years back. 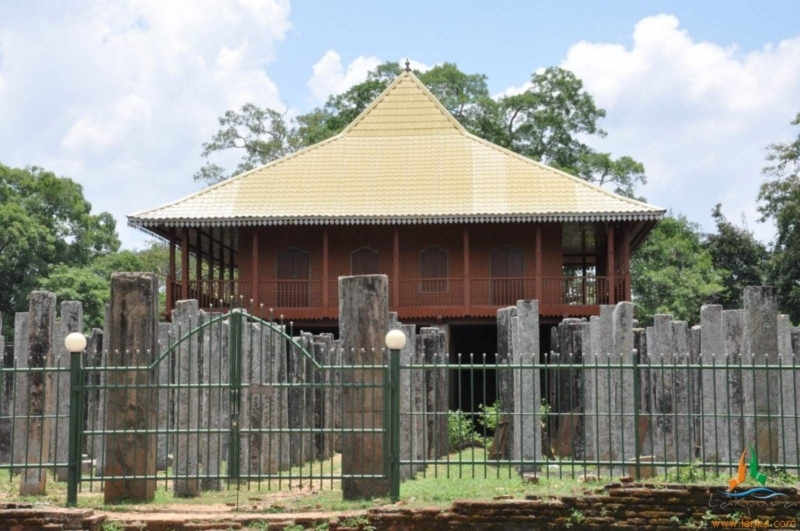 The monastery was donated to Buddhist monk Thera Mahatissa as a token of gratitude for the moral and material support extended to the king, at a time of adversity, in exile building an army to regain his kingdom. The main stupa at Abhayagiri Monastery , Abhayagiri Stupa was built over a footprint of Buddha. 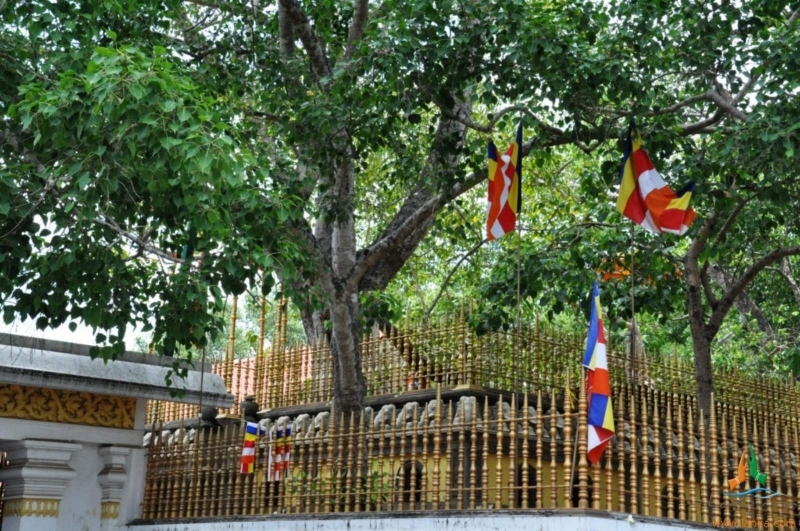 The Bo tree at the monastery is an off-shoot of the Sri Maha Bodhi tree also at Anuradhapura. 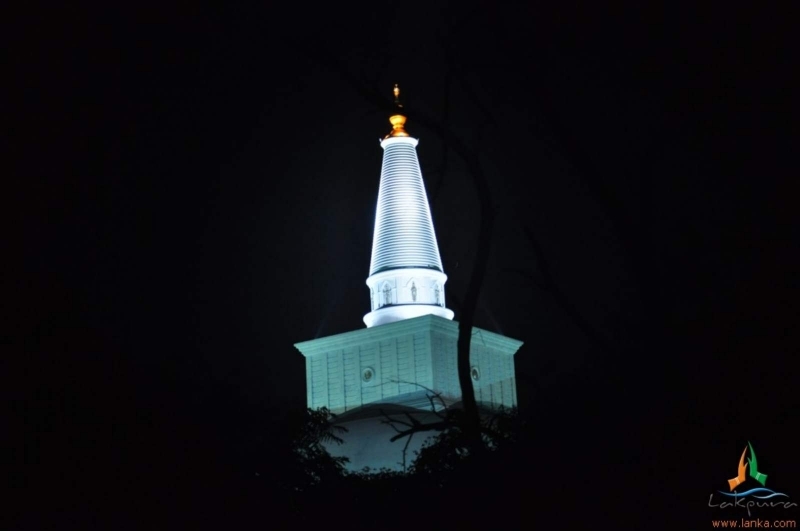 Standing at 370 ft in height, when it was first built, Abhayagiri Dagoba was the second tallest dagoba in Sri Lanka. During its glorious days, Abhayagiri Monastery was home to one of the finest libraries in the world. In memory of the Chinese Buddhist monk Fa-Hsien who studied the Buddhist manuscripts therein in the 5th Century CE, a new museum was established by the Chinese government so that the archaeological treasures discovered in the recent excavations could be deposited and displayed. 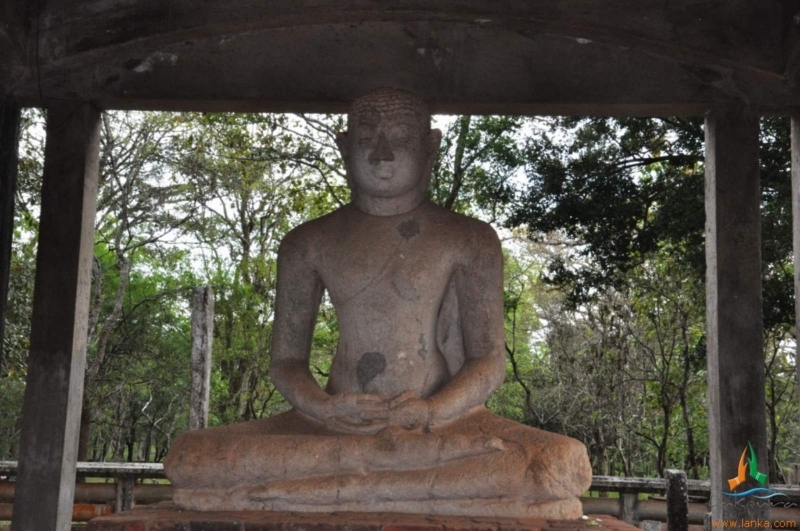 The 2m tall Buddha statue, popularly known as the Samadhi statue is a masterpiece of Sinhalese sculpture of Buddha in meditative posture carved in stone during the 4th century. 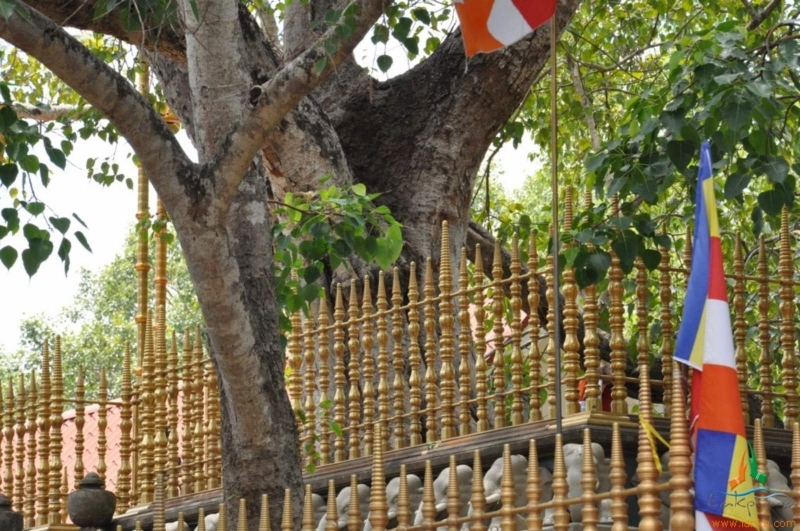 It was one of the four Buddha statues placed around a Bodhi tree facing the cardinal directions. 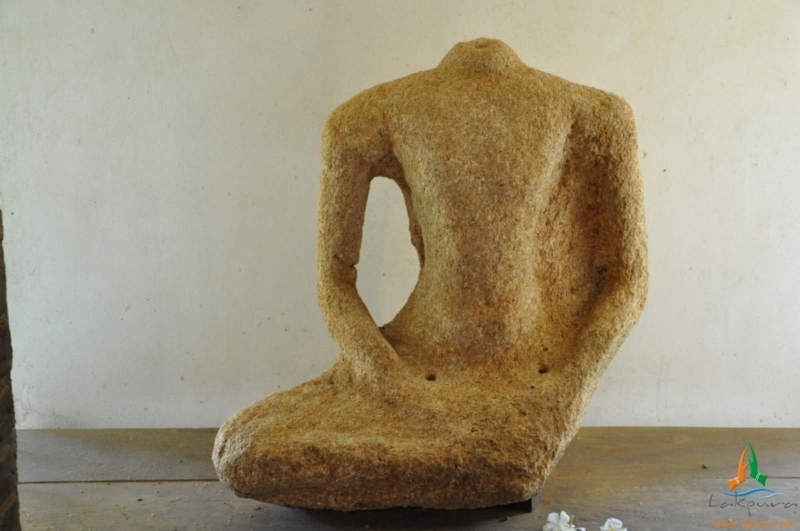 Belonging to the Abhayagiri monastic complex, the statue is sculptured out of dolomite marble seated in virasana and displaying the pose known as dhyana mudra. The hollow carved eyes were formally inset with crystals or precious stones. 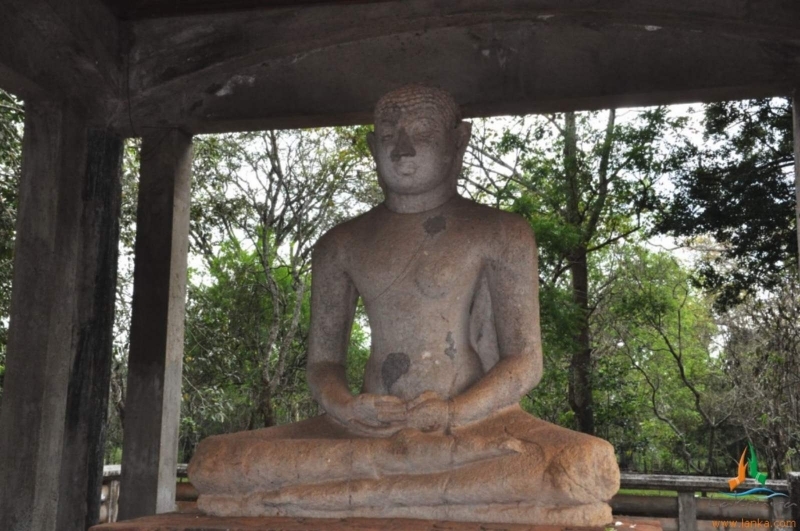 Excavations conducted at the site revealed that the statue belonged to the fourth century and was one of the four statues originally placed around a Bodhi tree growing there.Late Indian Prime Minister Jawaharlal Nehru who had visited the site was so taken up with the serenity of the statue, that it made a lasting impression on him for the rest of his life. It is said during the period of his imprisonment by the British colonialists, Nehru found solace in meditating upon an impression of Samadhi statue. 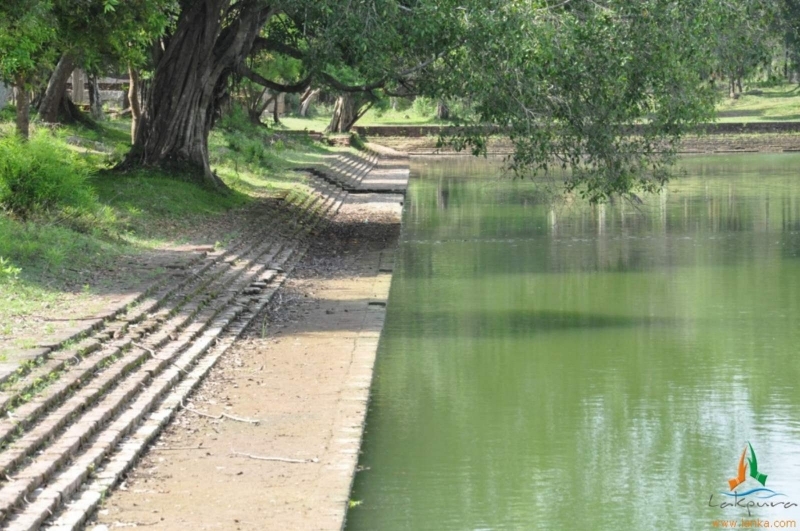 Kuttam Pokuna or the twin ponds, a monument of great beauty and superior engineering, was built for Buddhist monks at Abhayagiri Vihara for their daily baths. 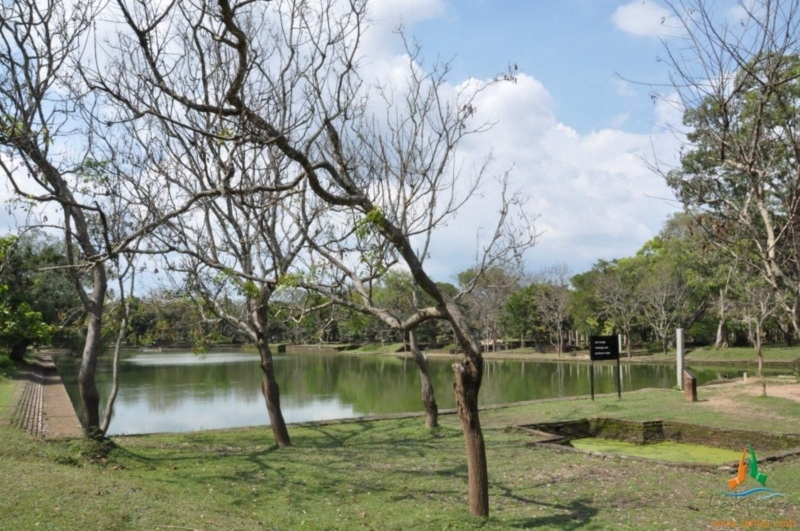 On architectural grounds, the ponds are assigned to the period between 8th and 10th century. 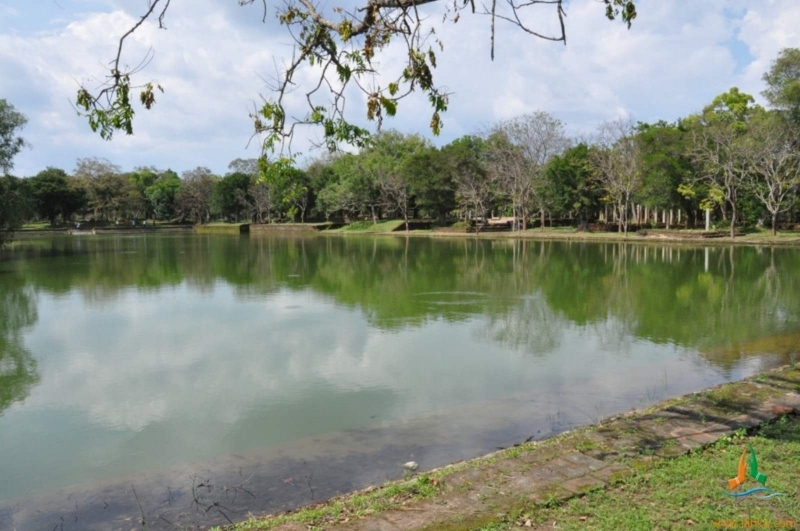 The larger pond is 132 ft in length and 51 ft in breadth while the smaller pond is 92 feet in length and 51ft in breadth. 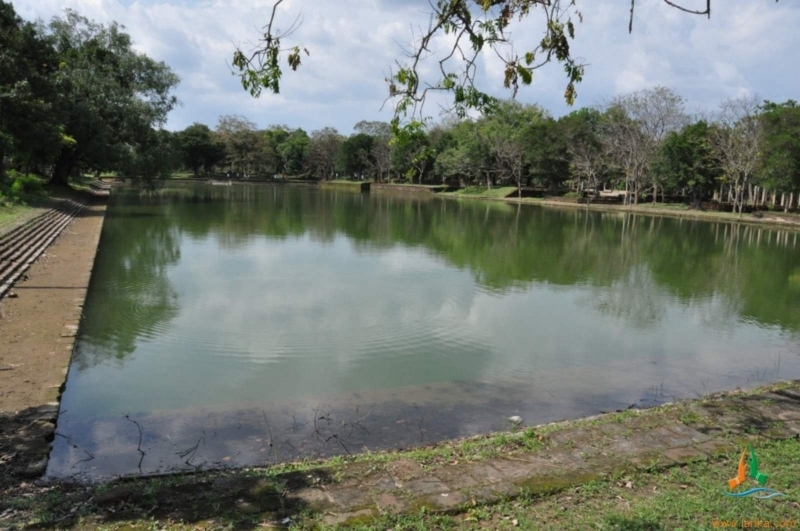 The depth of the ponds are 18 feet and 14 feet respectively. 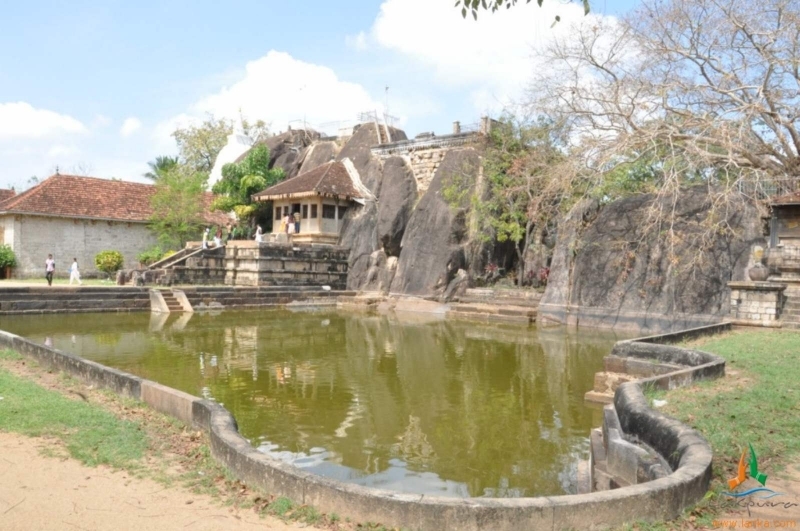 The supply of water to Kuttam Pokuna first flows into an enclosure built above the level of the ponds. 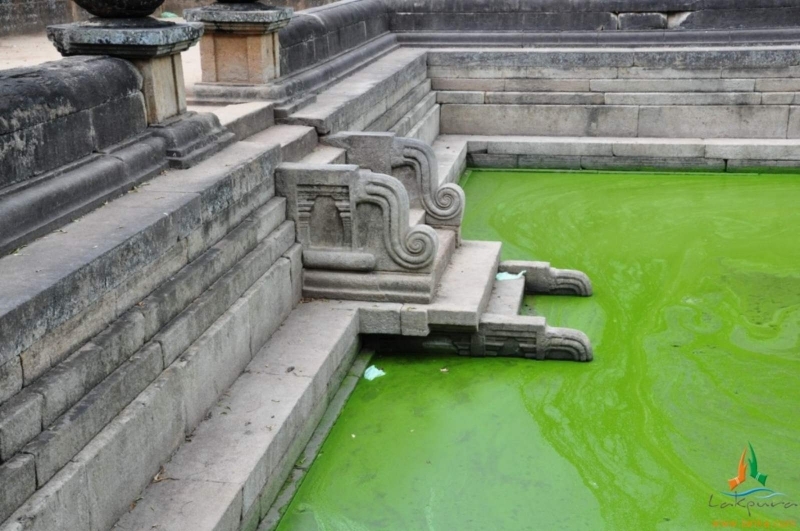 The enclosure channels the water into the smaller pond through a stone carved Makara (English: dragon). 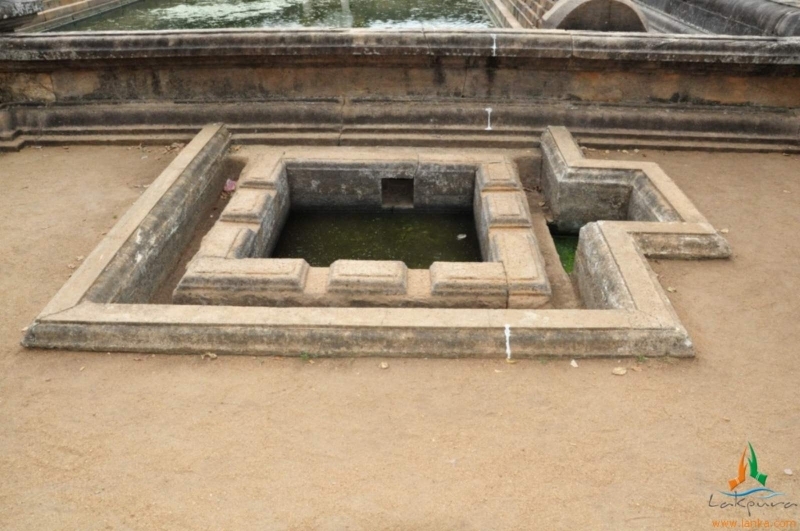 The smaller pond, in return feeds the larger pond of Kuttam Pokuna by means of a duct below the ground level. At the northern end of the smaller pond is a fine sculpture of a five hooded cobra carved in stone. 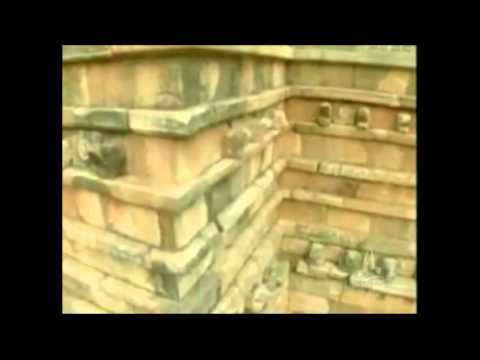 The cobra or Naga is a symbol of the guardian of water. 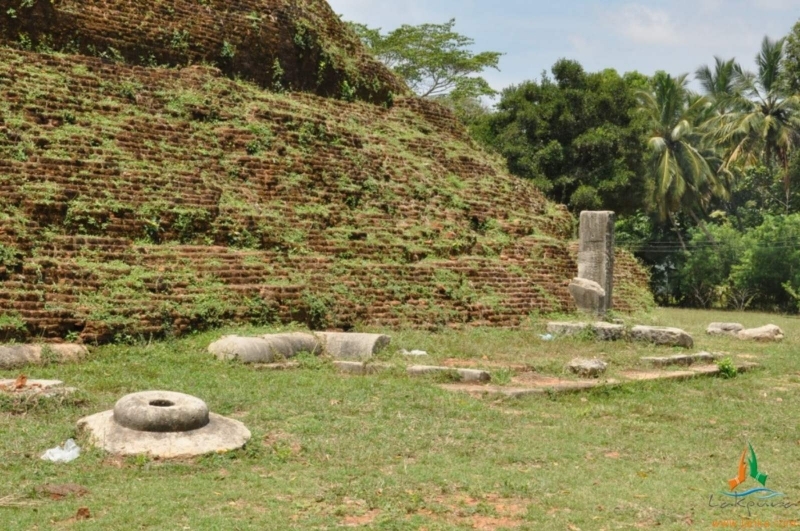 Mirisawati Dagoba was built by King Dutugamunu (161-137 BC), “The Hero of the Nation”, following the water festival held on the seventh day of the victory of the Great War that rescued the nation from the Southern Indian Kingdom of Chola. 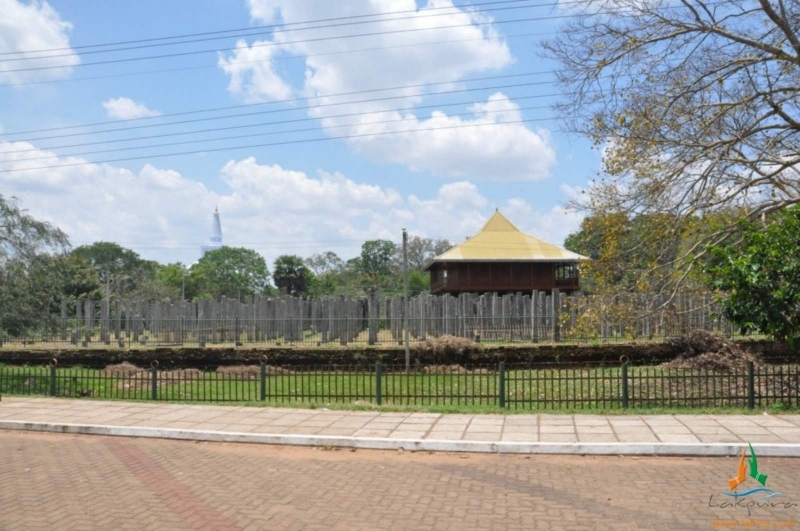 Mirisawati Dagoba was the first monument built by the king following his consecration. 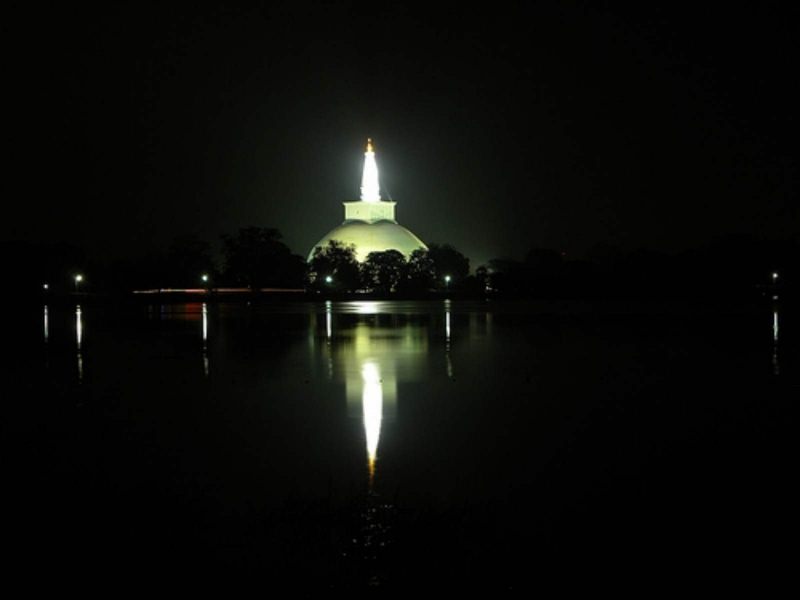 The location of the great stupa, according the great historical narrative, Mahavamsa, is of exceptional significance. 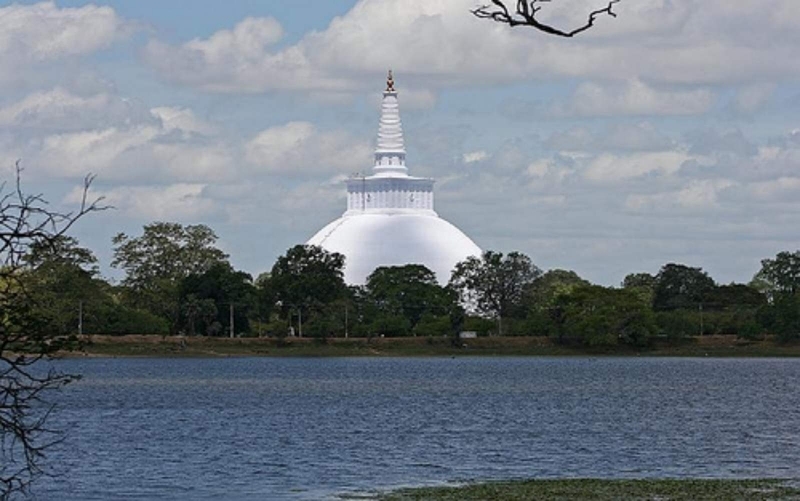 On the seventh day of the water festival at the Tissa rainwater reservoir, the King planted his spear, the royal standard containing a Relic of the Buddha, on the shore and laid his clothes. On his return from the bath at the reservoir, the king couldn’t pull out the spear off the bank. In spite of the repeated attempts the spear couldn’t be retrieved. 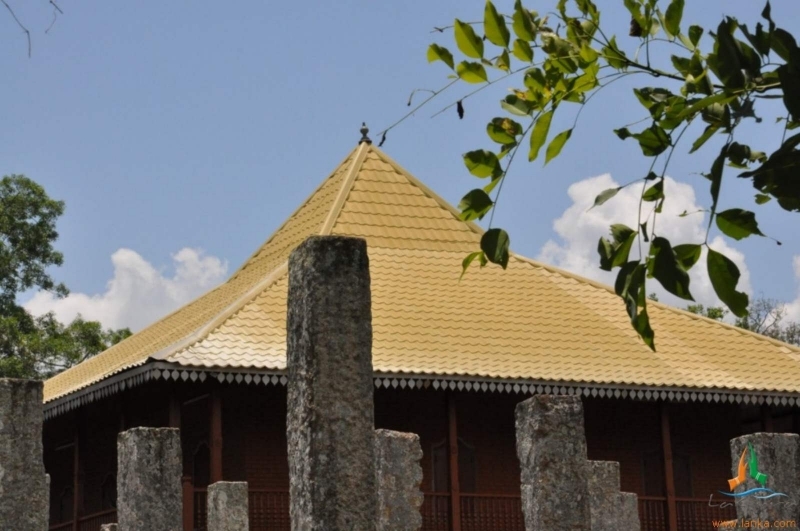 Having read the miracle as an omen, on the location enshrining the spear containing the relic of Buddha, was built the Mirisavati Dagoba and monastery. 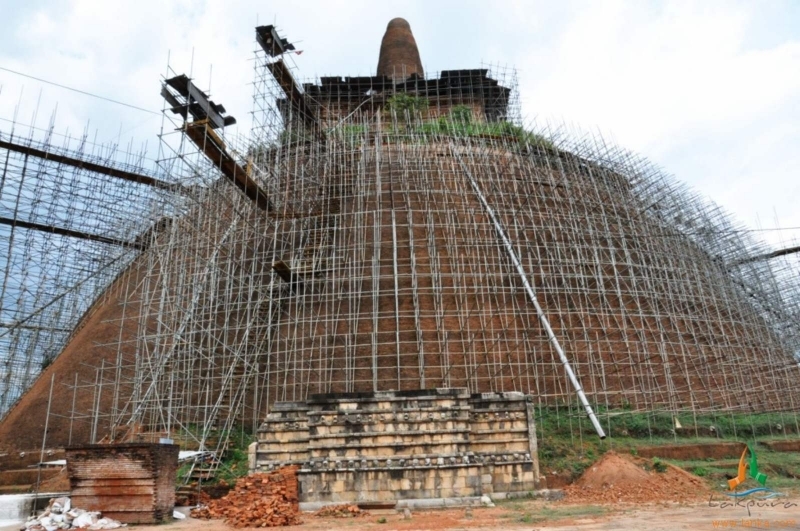 Having completed the construction in three years, the king donated the Viharaya to the Buddhist monks. 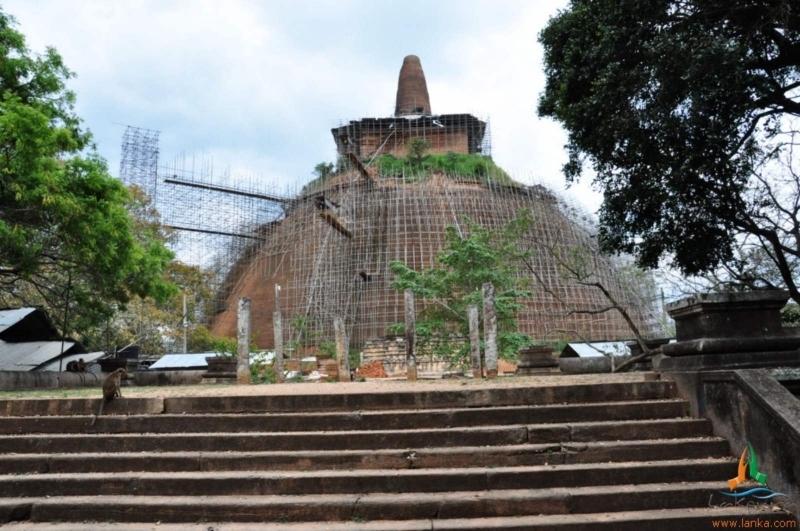 He also declared the dagoba was built in repentance of his failure to offer a portion of pepper curry in alms giving to the Buddhist monks. He had eaten it first. 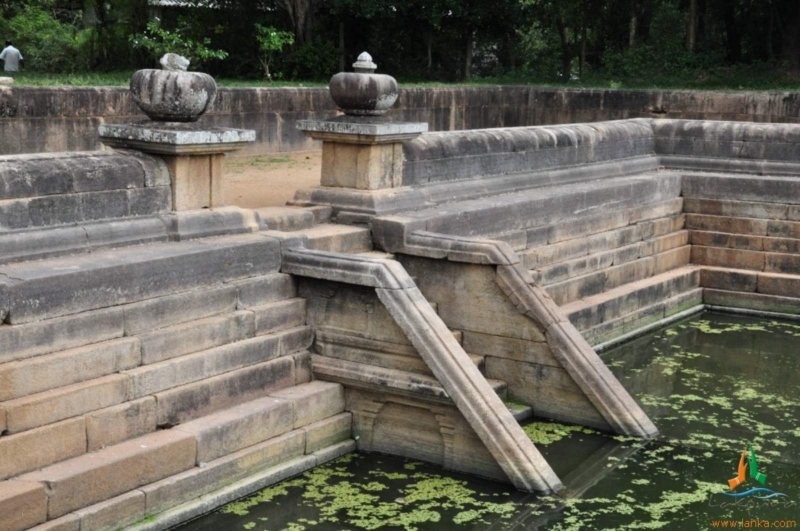 Isurumuniya Temple, built by King Devanampiyatissa, is located close to the Royal Pleasure Gardens by the side of Tisaweva (Tissa rainwater reservoir). 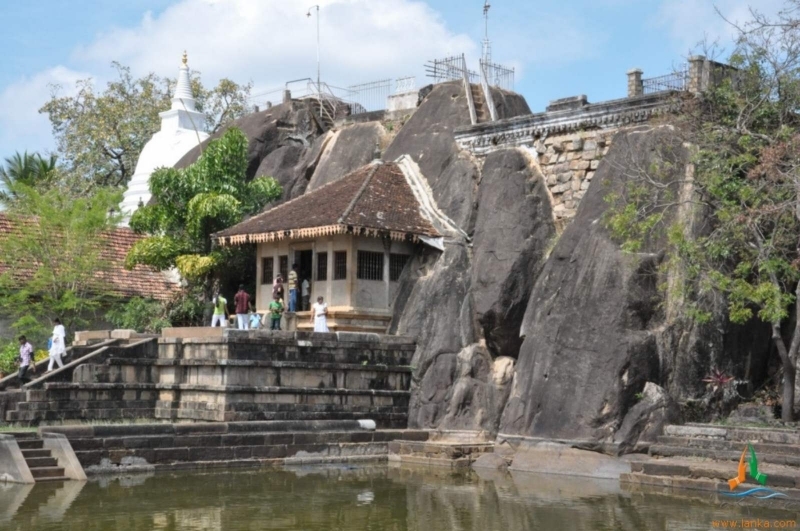 The Isurumuniya temple, built partly into a cave with a lovely pool in the front and with a boulder forming the rear wall, is a treasure-trove of exquisitely carved stone sculptures. The rock face bordering the rear of the pond is well adorned with a couple of exquisite rock carvings. One is of a herd of Elephants giving the impression of their playful antics in the pond. The sculpture has also captured the majesty of the leader elephant of the herd. The other one is of a noble horseman and his horse. The horseman’s right hand rests on his raised right knee. 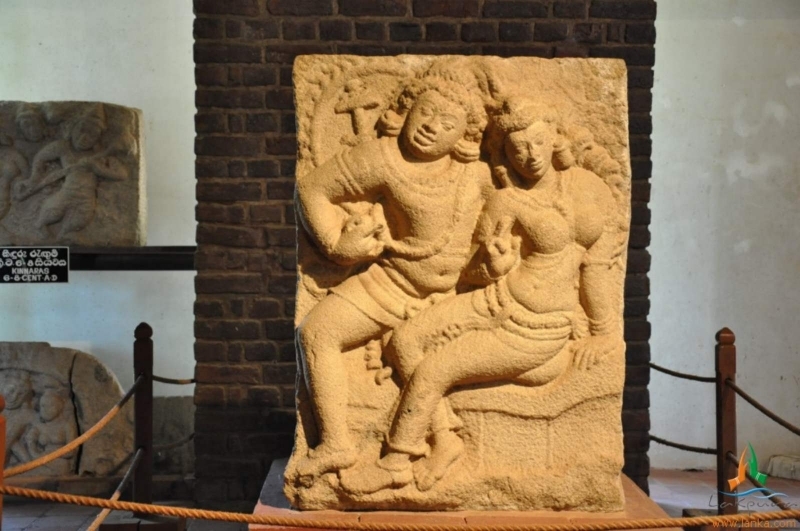 Also at the temple is a celebrated sculpture on a slab of granite called ‘Isurumuniya lovers’. 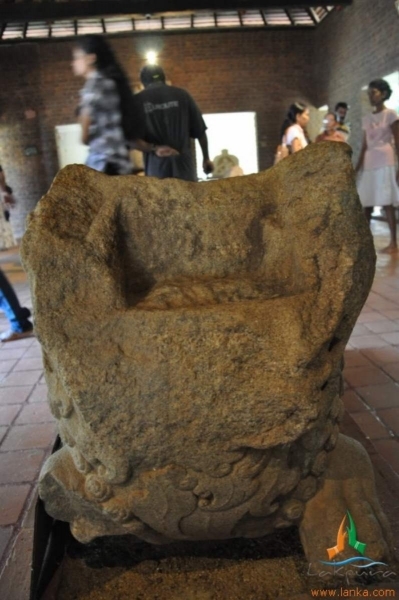 This has now been shifted to the Isurumuni Archaeological Museum. 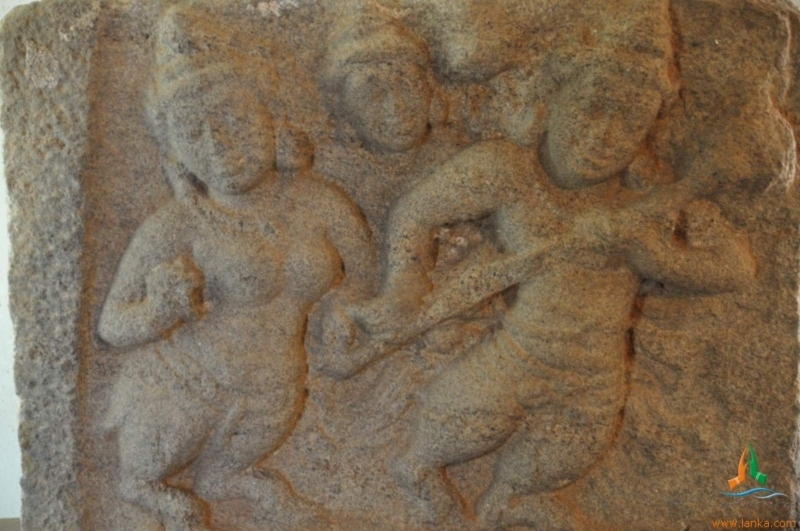 The lovers are identified as King Dutugamunu’s son Saliya and his non-royal consort Asokamala, the ultimate lissom women with matchless beauty. Saliya forfeited his royal titles for the sake of his lover. 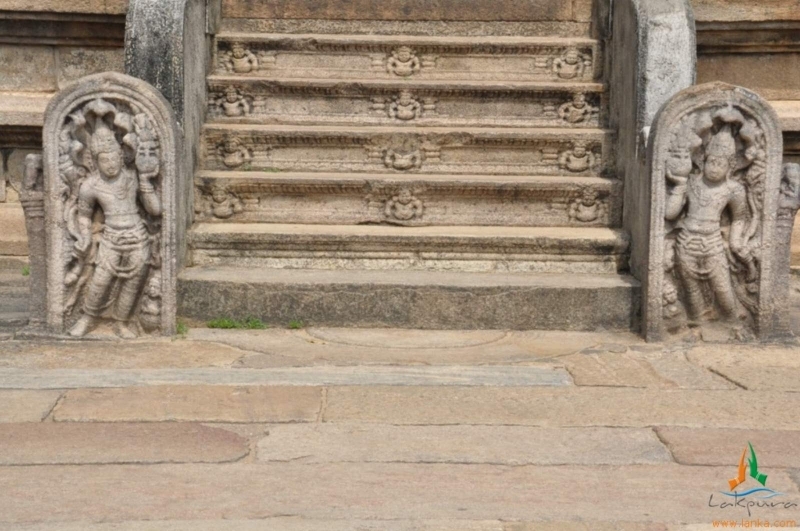 The stepping stone at the entrance called Sanda Kada Pahana (English: Moon stone), the guardstones at the entrance to the temple and the balustrades are exquisite carvings done in stone. 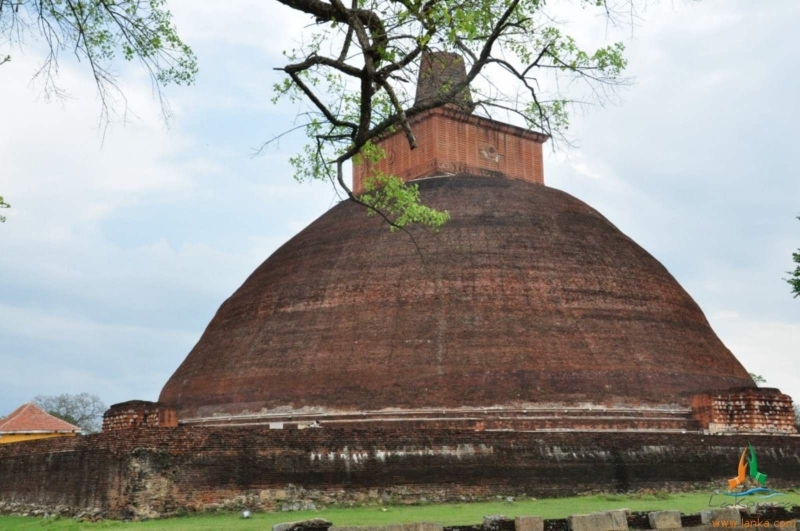 Thuparama dagoba, 20m in height and 60ft in diameter, one of the smallest of ancient stupas was built by King Devanampiya Tissa in the third century BC. 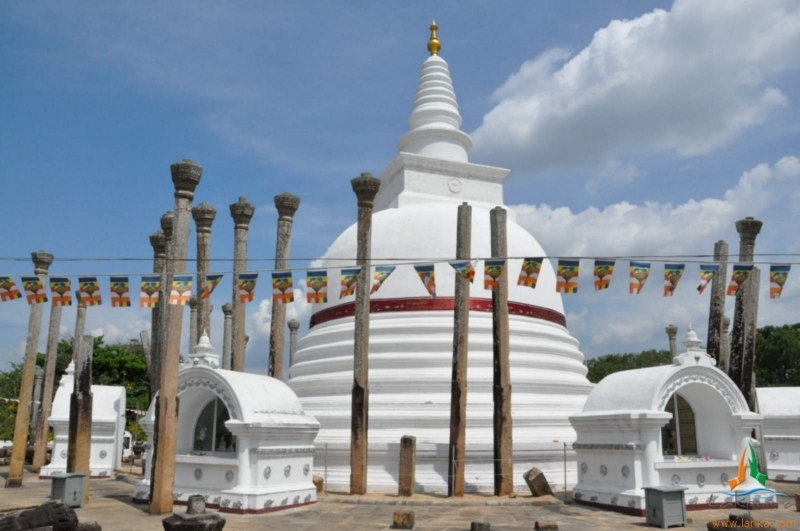 Thuparama dagoba is believed to enshrine the collar bone relic of Buddha. 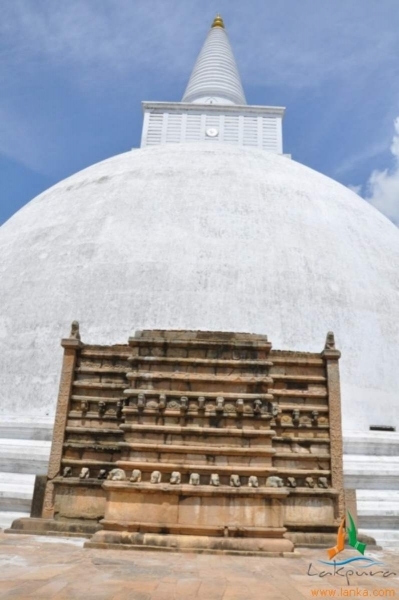 By the seventh century, the stupa was renovated by King Aggabodhi the second in the 7th century. 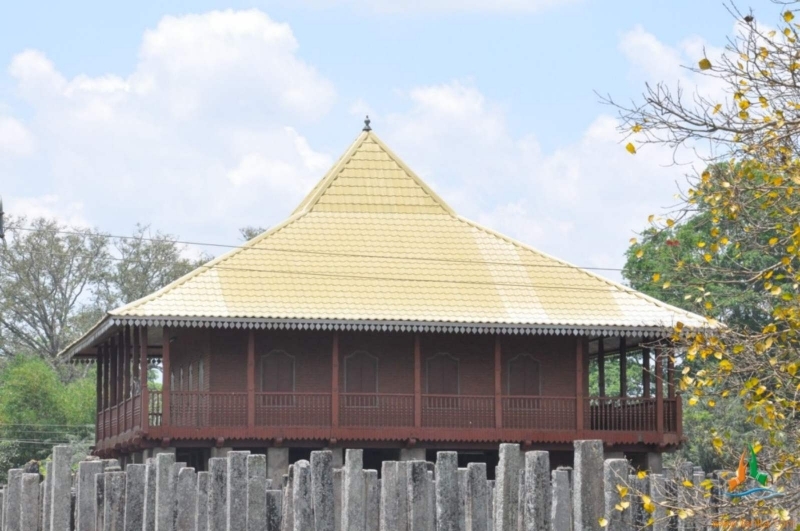 The graceful monolithic pillars surrounding it once upheld a circular roof making the shrine a Vata Dage (Circular – Relic – house) a characteristically Sinhalese architectural feature. The roof doesn’t exist today. Originally constructed in the ancient architectural tradition of a “paddy – heap” shape, its present “bell” shape dates to renovation in the 1862. 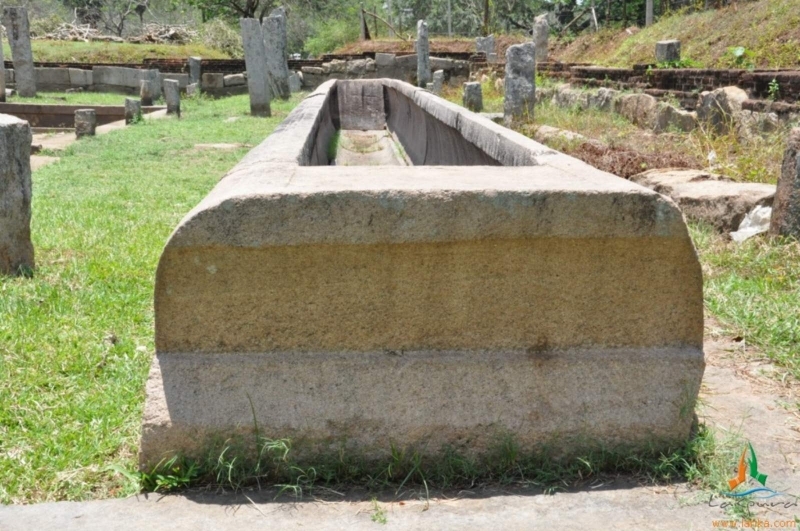 To the south-east of Thuparama dagoba are the ruins of a hospital as it is evident by the presence of an intact medicinal trough, an oil bath cut into a slab of stone. Museums have been established by the Department of Archaeology and Cultural Triangle Project. 1. 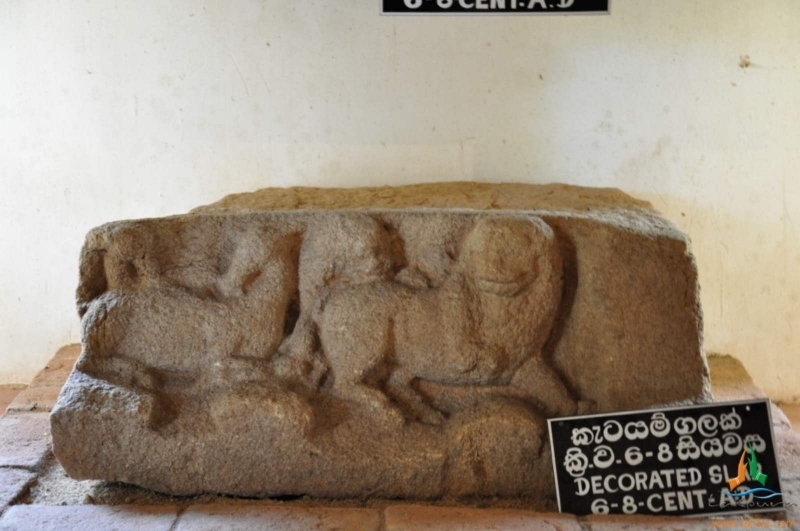 Archaeological Museums on the Ruwanweliseya Road. 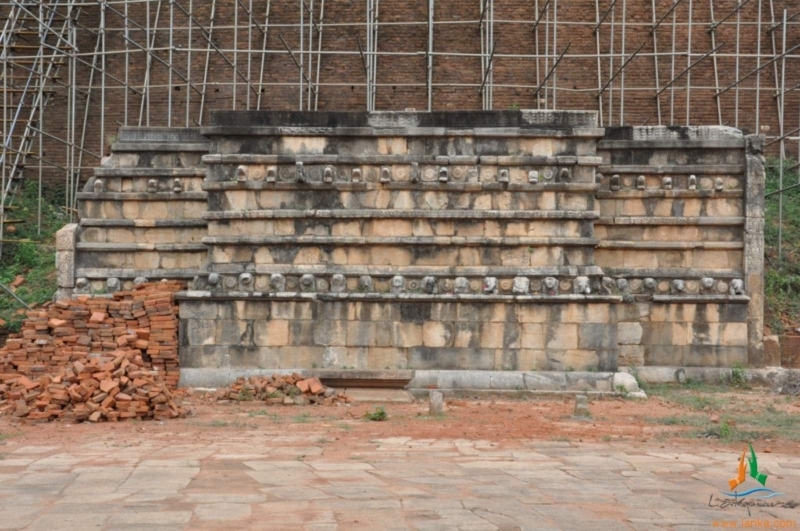 Most of the 8th-century Ratnaprasada or ‘Gem Palace’ lies in ruins today, though it was originally five stories high with a graceful, tiered roof. 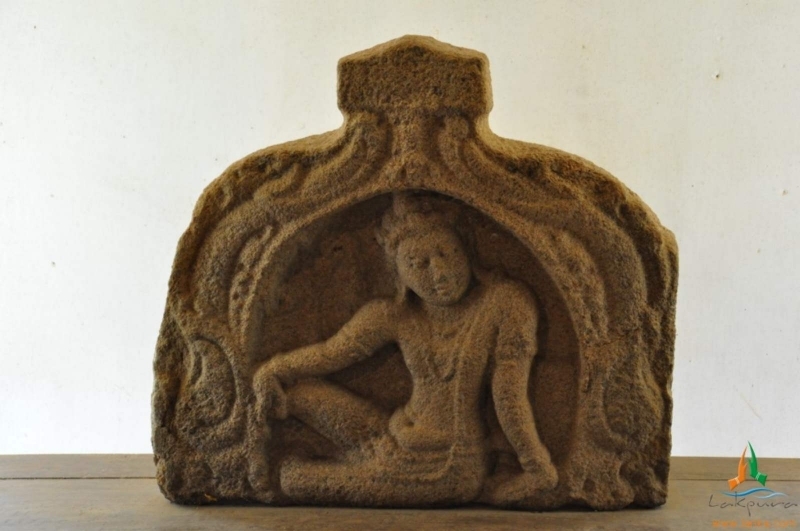 At its entrance, however, you’ll find a beautifully carved mura gala (guardstone), which depicts the Cobra King holding a vase with a flowering branch, with a dwarf attendant at his feet and his head framed by a cobra hood. 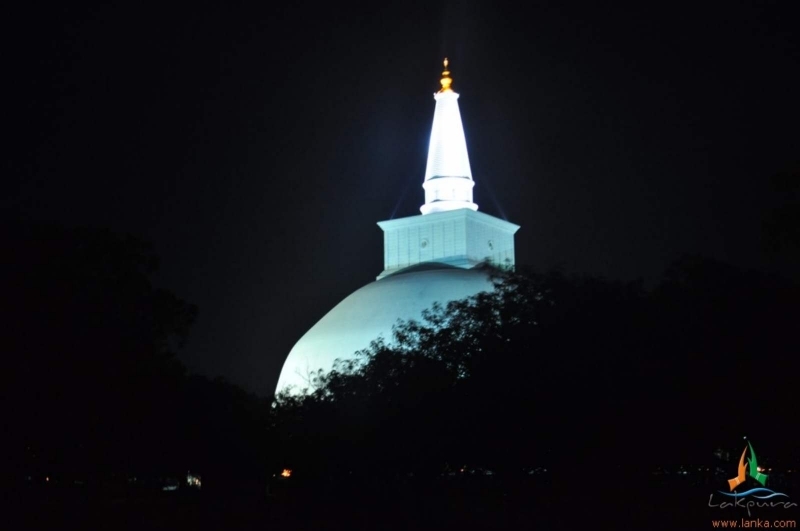 The Jetavanarama Dagoba’s massive dome rises above the entire eastern part of Anuradhapura. 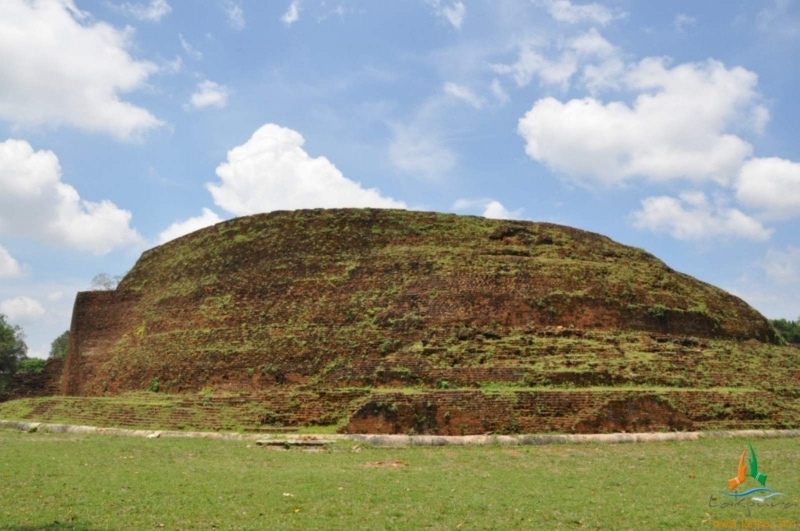 Built in the 3rd century by Mahasena, it may have originally topped 120m, but today is about 70m – similar to the Abhayagiri. When it was built it was almost certainly the third-tallest monument in the world, the first two being Egyptian pyramids. Its vast, bulbous form is unplastered and said to consist of more than 90 million bricks.